I am so excited to be hosting this weekly party and I have four amazing ladies co-hosting along with me! 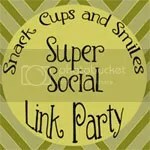 Last week’s party was a huge success and we met so many new friends on Google+! Today we will be sharing our Facebook pages! I have met several new people on Facebook and love interacting with everyone there, so this is one of my favorite parties!! Found lots of new Facebook pages! Great! Glad you could stop by.